Children's Book Week is the longest-running literacy initiative in the country. It was established in 1913, and every year, it promotes books for young people and the joy of reading. Author and illustrator appearances, storytelling, parties, and other book-related events are held at schools, libraries, bookstores, museums, and homes throughout the country. You can learn all about it at the official website, and find out if there are any special events going on in your area by visiting the official events page and the local events page. And check back at the Book Week site on Tuesday, when the winners of the 2012 Children's Choice Book Awards will be announced. Voting is now closed, but you can see the list of finalists and keep your fingers crossed for your favs! I spotted several of our Kids' E-Book Bestseller top ten authors and I'm rooting for each one of them! 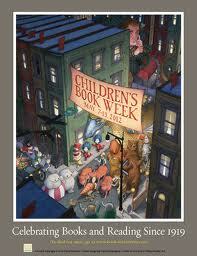 The captivating Children's Book Week poster was designed by three-time Caldecott medal winner David Wiesner. Like it? You can order copies (paying only the shipping) and learn more about it at the site. Here at KidsEBookBestsellers.com, we're celebrating books for young readers EVERY week. Check this week's bestseller list, updated every Saturday at 8 AM, for the latest and greatest books and authors in e-format!